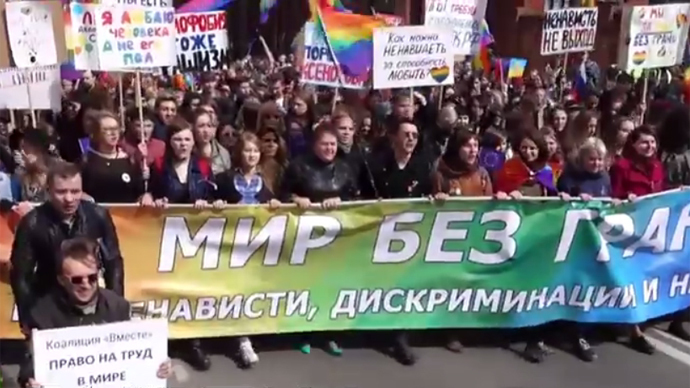 Police in St. Petersburg wouldn't allow controversial legislator Vitaly Milonov, best known for his anti-gay stance, to interfere with a gay pride march on May Day. He tried to stop the march on the grounds of a 'gay propaganda' law he himself sponsored. An LGBT activists' column was part of Friday's massive rally, which marched along Nevsky Prospect, the city's main street. More than 90,000 people from all ranges of the political spectrum participated, from the ruling United Russia party to Communists and various small opposition groups. Milonov along with a group of about a dozen of supporters tried to block the gay pride column, which was carrying rainbow flags and banners calling for tolerance, including one depiction of the politician himself. He wanted to stop the activists, saying they were violating a controversial law he sponsored a few years ago, which bans propaganda of gay lifestyle to minors, and brought some minors among his supporters to make his case, the Fontanka newspaper reported. His other complaint was about Ukrainian and American flags being carried by another part of the marching column allied with the LGBT activists. Police officers guarding the rally were not impressed with the argument. They asked the lawmaker and his group to move aside and not provoke a conflict. The discouraged MP and his group let the column pass and went after them, with police keeping the two separated. They went their separate eventually. Milonov is a controversial figure in St. Petersburg due to his often heated anti-gay campaigning. Critics call him homophobic and sometimes target him with LGBT-themed pranks. In February, a couple of lesbian girls met the politician on a plane and took photos of them kissing with Milonov in the background. The set quickly went viral in Russia.